Prices of cigarettes in Sri Lanka are the highest in the Asia Pacific region and the second highest in the world with the island rapidly turning into a cigarette smugglers ‘paradise’. These comments were made by Roshan Madawala, Managing Director, Research Intelligence Unit (RIU) at Tuesday’s launch of the “Research Report on Taxation in Sri Lanka – a case study on the Tobacco Industry by the RIU” at the Galadari Hotel in Colombo. RIU has prepared the report in collaboration with the Big Issue Magazine. Quoting the report, he observed that the fiscal and taxation policy of a country is a major determinant of the economic policy of that country, particularly in areas such as revenue, public debt as well as resource allocation and economic stability. He said the policy on tobacco should focus on achieving two important objectives – reduce the negative health impact of tobacco consumption while securing government taxation revenue with the tobacco industry being one of the largest contributors. 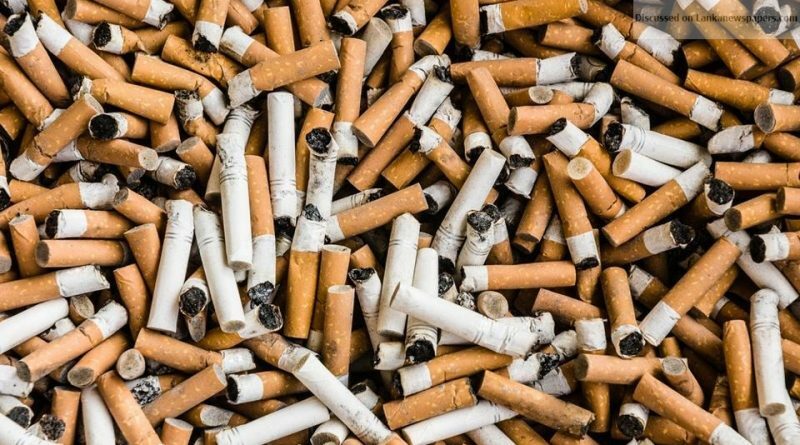 The World Bank has suggested that a 10 per cent rise in taxes would result in an 8 per cent fall in smoking in low and middle income countries. But, in Sri Lanka with the availability of much cheaper alternatives such as beedi, along with the choice of illicit cigarettes, the low price structure indicates that a ‘cut and paste’ approach to tobacco policy across international markets won’t work. In reality a 257 per cent increase in the price has resulted in a 25 per cent increase in overall smoking and in essence, taxation-driven price hikes alone have proved that they are insufficient policy measures for delivering the reductions in smoking prevalence that has been quoted by international agencies. With the findings of the research some observations and recommendations are: De-politicize the issue of tobacco taxation and base it on a rationalised, balanced and well researched policy framework; look at policy approach of Germany, Pakistan and others who have achieved their goals by monitoring and responding to their local environment and dynamics rather than blindly accept policy dictates from international agencies; consider the more important policy measures that are aligned with education and health awareness rather than only looking at taxation to achieve health goals; review policies on elated industries like beedi and review the policy towards smuggling. According to the report, other ancillary issues that are interwoven to this critical industry also impacted it such as the beedi manufacturing and tobacco growing. In the case of beedi manufacturing, the rural poor use it because of its price and also it has now become a cottage industry and also government earns revenue by way of taxation. The Chairman, All Island Tobacco Cultivators Association at the launch suggested to be an intervenient party to the discussion and said that there are about 20,000 farms and around 300,000 directly and indirectly dependent on the growing of tobacco. He pointed out that the total industry is adversely affected due to the smuggling of cigarettes as, according to information, only one in 10 of smuggled containers having undeclared cigarettes is detected while the other nine would invariably be merchandised in the country. This affects cigarette sales and due to this fact they are unable to sell their tobacco cultivation to the company. He pointed out that one smuggled container would fetch around Rs. 1 billion in income. The report indicated that the beedi industry and consumption in the country could also contribute to the increase in smoking. The beedi industry in Sri Lanka commenced in 1956 and since then it has come down from generation to generation enveloping the rural poor. In this industry, the supply chain commences with the purchase of tobacco leaves, including the refuse leaves rejected by the CTC. This tobacco is then wrapped in a ‘Thendu Leaf’ imported from Orissa, India. Over the years the beedi wrapping process has become almost exclusively a cottage industry that employs a large number of village level households. The research indicated that there are 700 registered/ licensed beedi producers and many more small players in Sri Lanka. Of those registered around 50 are well established and pay ETF and EPF to their workers. The beedi industry revenue contribution is Rs. 2.8 billion in 2016. The report noted that consistent tax hikes on cigarettes from 2009 to 2015 have since given way to a large and unprecedented hike in 2016 which hampered the objectives of both the Ministry of Health and the Ministry of Finance. It noted that over recent years, Sri Lanka has introduced unpredictable and seemingly ad-hoc increases in the rate of taxation on cigarettes which has partly caused current market distortions that have triggered a massive inflow of illicit products. This well researched report provides quality statistics and data on the tobacco industry in Sri Lanka. May be highest prices in the world. But still it is affordable even among youth and poor people. The profits of the tobacco company has increased in spite of the fact that sales have gone down. So what is the logic behind?